NYC, 02/16/2019, 3:00PM. 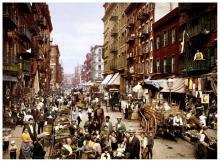 New York City Food History - Commodities and Consumption. This class is an introduction to the food history of New York City, telling the stories of the edible goods produced, consumed, and venerated in homes and restaurants within the five boroughs. The history of restaurants, the meals of the wealthy and those of the working class, and the foodstuffs on all these plates will be explored. New York City is a city of immigrants, and these diverse groups from around the globe have contributed to a constantly evolving definition of urban food culture. The topic of the first week will be Commodities and Consumption. This is the introduction session to the foods grown, raised and eaten in New York City during various historical periods. What was grown and sold for consumption in the pre-industrial period? How did the value of these foods change in relation to the development of NYC society? How did the changing ethnic demographic of the city impact the foods produced? The Professor: Dr. Shayne Figueroa is a food historian and recently earned her PhD in Food Studies from New York University. Her dissertation examines the social history of the school lunch program in New York City during the postwar period. Shayne has taught undergraduate courses at NYU (Food Issues in Contemporary Society), The New School (Introduction to Food Studies; Kids and Food), and Sterling College (Urban Food Experience.